Heat oven to 350°F (325°F for dark or nonstick pans). Generously spray bottoms and sides of two 9-inch round cake pans with baking spray with flour. In large bowl, beat cake ingredients with electric mixer on low speed until moistened, then on medium speed 2 minutes, scraping bowl occasionally. Pour into pans. Bake and cool as directed on box for 9-inch rounds. On serving plate, place 1 cake, rounded side down. Spread with half of the frosting; top with half of the mangoes and half of the coconut. Top with second cake, rounded side up. 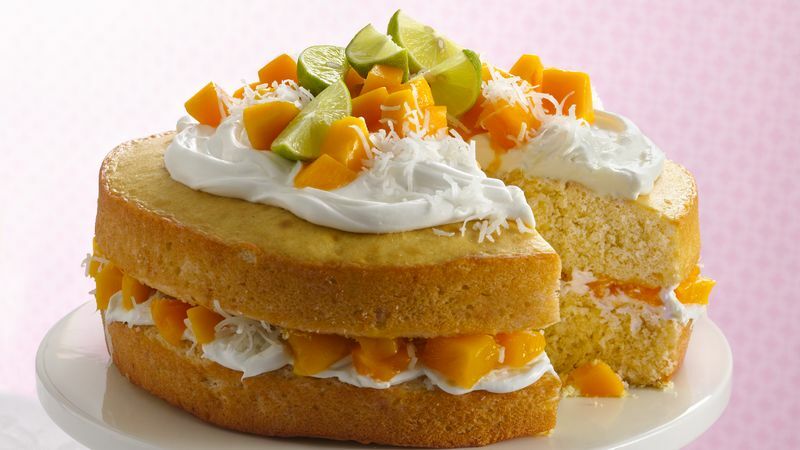 Spread with remaining frosting; top with remaining mangoes and coconut. Store loosely covered in refrigerator. Mango nectar is a noncarbonated beverage made from the pulp of mangoes. Shop for it in the fruit juice aisle. For a colorful accent, top the cake with fresh lime wedges. An easy way to grate citrus peel is to use a microplane grater. It was originally a woodworking tool, but it’s now sold for kitchen use. The delicate grated lime peel in this recipe adds a complementary flavor to the cake.